An international gesture for peace will take root early next year at the southern tip of Okinawa, when a donation from India is set into place. 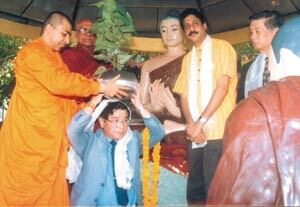 Some five years ago Dr. Nobuo Akamine took a trip to India. 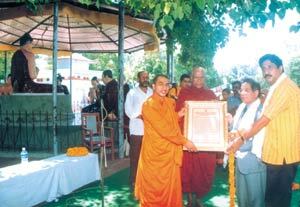 One of the places he visited was Sarnath, the site of the sacred Maha Bodhi tree under which Gautama Buddha reportedly achieved the enlightenment. This tree also symbolizes peace, and Dr. Akamine got an idea of transplanting a sapling of the holy tree to Okinawa, the site of fierce battles and much death and suffering during the waning days of the World War II. It’s not so simple, though, to go and get a sapling from the holiest of trees in the Buddhist world. As the idea began to take shape, Dr. Akamine enlisted the help of Pramod Bakshi of Okinawa Tourist Services, and the backing of Shosaku Yamada, the director at Okinawa Peace Prayer Monument and Okinawa Association Foundation. 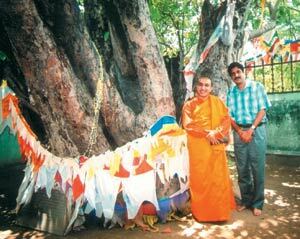 After extensive correspondence with the Maha Bodhi Society of India, the custodian of the holy tree agreed to donate six saplings to be transferred to Okinawa. The saplings were blessed and handed over to a delegation from Okinawa on July 19. The saplings will be planted to their final site at the Peace Prayer Monument early next year after they have grown and gained strength. In that way they will also be able to take firm root before the next typhoon season begins. The project undertakers hope that the holy tree inspires Okinawans and visitors alike to strive for world peace. “We do not plant this tree here for any religious purposes. Our aim is to make it the symbol of world peace, and help to transform Okinawa to the center of that peace,” Bakshi says. According to old texts, Siddhartha Gautama, the Buddha-to-be, had been living on the banks of the Nairanjana River with five ascetic followers for six years practicing austerity. Realizing that austerities could not lead to realization, he abandoned them. His five ascetic companions, disgusted at his seeming failure, deserted him and left for Sarnath. He then moved towards the village of Senani where a Brahmin girl, Sujata, offered him rice milk. Accepting from a grass-cutter a gift of kusa grass for a mat, he took a seat under a pipal tree facing east. He resolved not to rise again until he would attain enlightenment. “Here on this seat my body may shrivel up, my skin, my bones, my flesh may dissolve, but my body will not move from this seat until I have attained Enlightenment, so difficult to obtain in the course of many kalpas". As Gautama sat in deep meditation, Mara, Lord of Illusion, perceiving that his power was about to be broken, rushed to distract him from his purpose. The Bodhisattva touched the earth, calling it to bear witness the countless lifetimes of virtue that had led him to this place of enlightenment. When the earth shook, confirming the truth of Gautama's words, Mara unleashed his army of demons. In the epic battle that ensued, Gautama's wisdom broke through the illusions and the power of his compassion transformed the demons' weapons into flowers and Mara and all his forces fled in disarray.